At the beatification of Louis and Zélie Martin, Cardinal Saraiva Martins, reading the Pope’s letter, described them as “laypersons, spouses, and parents.” Louis, spouse and parent, knew that the first duty of a good father is to be a good husband. Zelie wrote about him, “I am always very happy with him; he fills my life with tenderness and sweetness. My husband is a very holy man; I wish every woman had a husband like him" and later “Our feelings were always in unison, and he was always my support and my consolation.” In the years of their marriage (1858-1877), Louis was a most generous husband and father. Seeing the success of Zélie’s lace business, he gave up the craft of watchmaking for which he had trained for many years, sold his business to his nephew for a modest price, and handled the traveling and business end of the lace-manufacturing business. 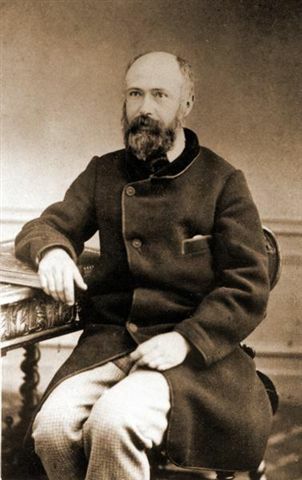 After Zélie’s death, he left his friends in Alencon to give his daughters the advantage of the influence of their maternal uncle, aunt, and cousins at Lisieux. At a time when the father was usually “master of the house,” he gave his older daughters a free hand in running the household and teaching their little sisters. He spared nothing to develop their talents, procuring art lessons and supplies and giving them every advantage in his power. Louis Martin was a brave man. As a boy, he belonged to a boys’ military club. Exercising regularly, he grew into a tall, vigorous man. He swam well enough to save several persons from drowning, saved trapped persons from fires, and was so courageous on the streets that, if he was out later than usual, his daughters worried that he might be badly injured while trying to separate men who were fighting. As a father, Louis created a disciplined structure for the daily life of every member of his family. In all weathers they attended morning Mass together. The children had to eat what was set before them. The girls hardly missed a day at school: in eight years Celine was absent only two days. He did not like to see them idle and encouraged them to develop various hobbies. Yet his feminine side was well developed. When he was left a single parent, he became both father and mother to his daughters, who said “our father’s affectionate heart was enriched with a truly maternal love for us.” Many days he escorted the girls to and from school, listening patiently to the accounts of their days. Every evening he joined them after supper in their little salon, making toys for them, singing to them, telling them stories, reciting poems, and playing games before family prayers. " I am the Bobillon [that is, tender and kindly] with my children," he would say. Louis had a profound respect for the spiritual lives of his daughters. He not only gave them the greatest freedom to fulfill their vocations but actively supported them in whatever they found God asking of them, "allowing the Creator to deal directly with the creature." He undertook journeys and expenses to allow them to make retreats and consult their spiritual directors. At a time when many men became furious if their daughters wanted to enter the convent, sometimes even preventing it, Louis gave his consent freely and donated large sums to the convent his daughters entered. When his oldest daughter, Marie, his favorite, confided her vocation to him,he said "Ah . . . but . . . without you! . . . I thought you would never leave me," yet he gave his permission at once. When the family was visiting Alencon before Marie left them, and Leonie, abruptly and without asking permission, entered the Poor Clares, he permitted her to remain there and supported her generously.When the vicar-general of the diocese failed to support Therese when she appealed to the Pope for permission to become a Carmelite at fifteen, Louis, meeting him several days later in Rome, said forthrightly: “You know very well that you had promised to help me.” Later he was so impressed with Celine's artistic talents that he wanted to take her to Paris for lessons from the best artists. Yet, when she told him that she planned to become a Carmelite after he no longer needed her care, he said "Come, let's go together to the Blessed Sacrament to thank Him for the honor He does me in choosing His spouses in my home. If I possessed anything better, I would hasten to offer it to him." Therese said that the better thing he had to offer was himself. When he became paralyzed and had to accept being cared for in an institution and later by his family, he surrendered himself completely and was deeply touched by their devotion. He said to his brother-in-law, "In heaven, I'll repay you for all this." Does not Therese, in these words, offer Louis as a father to all of us? If, like Louis, our own fathers were good and loving, then, in the communion of saints, Louis can join them in pouring out on us the love of the heart of Christ. If, like many of the children Louis helped during his lifetime, we did not experience kindness from our fathers, or if we never knew them, Louis can be the vessel through which God pours out on us grace, tenderness, and healing.